Syphilis. 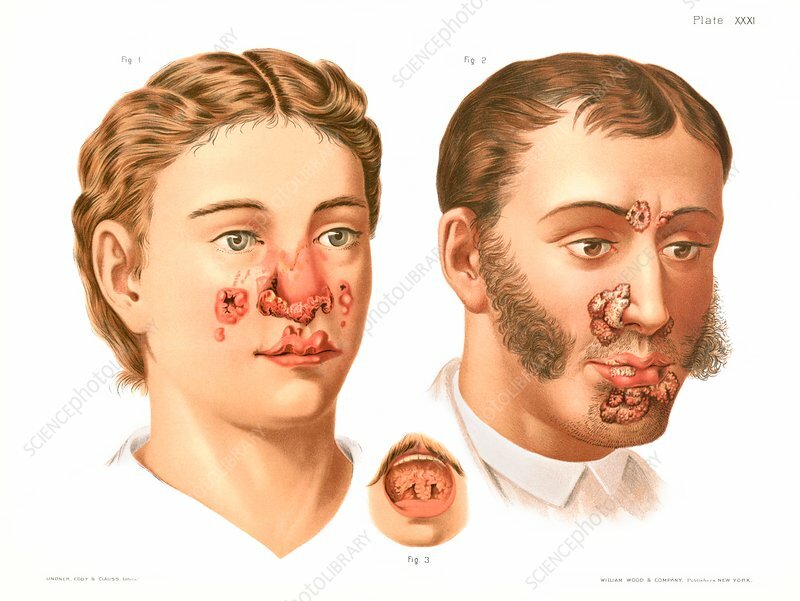 Historical medical illustration showing tertiary syphilis lesions, known as gummas, on the faces of two patients, and on the soft palate (Fig. Syphilis is a sexually transmitted infection caused by the bacterium Treponema pallidum. The disease has three stages, first an ulcer (known as a chancre) at the site of infection, followed several weeks later by a systemic skin rash. The third stage, which follows a latency period that can last for years, involves spread to the organs and nervous system and can cause mental illness and death. From Atlas of Venereal and Skin Diseases by Prince Albert Morrow, published in 1889.